founded at Doreri Bay by Britain. East Indies (Netherlands New Guinea). 1880 - 1880, 15 Feb 1881 - 1882? U.K., and Germany along the 141st meridian. the New Guinea Company (Neu-Guinea-Kompagnie). New Guinea (British New Guinea territory). 1886 British colony of New Guinea. 26 Sep 1914 Australian occupation of Bismarck Archipelago. 11 Nov 1914 Australian occupation of German New Guinea. 28 Jun 1919 Germany formally renounces claims to the islands. Papua to 22 Jan 1943; renamed Niyuginia). Guinea; with Australian civil administration. 1 Dec 1973 Papua New Guinea becomes self-governing. 1 Sep 1975 - 16 Oct 1975 Secession of Bougainville. declares Papua independent, without effect. 17 May 1990 - 22 Jan 1998 Secession of Bougainville. ¹Full style from 16 Sep 1975: "Queen of Papua New Guinea and Her other Realms and Territories, Head of the Commonwealth." Territorial Dispute: Relies on assistance from Australia to keep out illegal cross-border activities from primarily Indonesia, including goods smuggling, illegal narcotics trafficking, and squatters and secessionists. Santa Isabel, Shortland Islands (on 29 Oct) and Ontong Java. and Ontong Java Islands become part of British Solomon Islands. the Treaty of Berlin of 14 Nov 1899). 20 Sep 1905 German administration post established at Kieta on Bougainville. 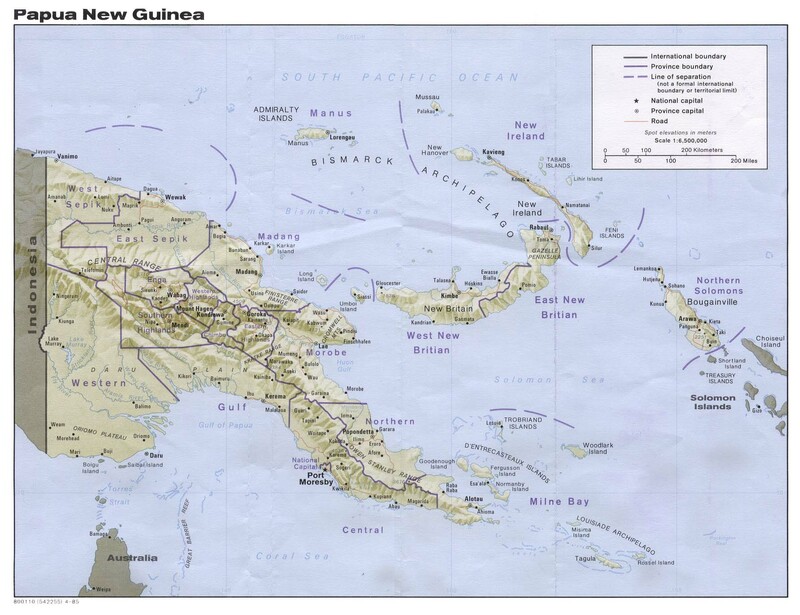 Trust Territory of New Guinea, under Australian administration). 30 Mar 1942 - 8 Sep 1945 Japanese occupation (Allied forces land at Torokina on 1 Nov 1943). Apr 1972 Commercial production begins at Panguna copper mine. 1973 Bougainville Interim District Government. providing for devolution of administrative powers and functions. 25 Jul 1975 Bougainville Interim Provincial Government established. 16 Oct 1975 - 29 Apr 1976 Bougainville government is suspended by Papua New Guinea. Papua New Guinea/Bougainville agreement of 7 Aug 1976). 11 Aug 1977 Constitution adopted, Bougainville named "North Solomons Province." by Papua New Guinea/Bougainville Revolutionary Army Agreement. Aug 1990 - 10 Apr 1995 Bougainville provincial government suspended by Papua New Guinea. to, by the Honiara Declaration), but is not implemented. 13 Feb 1993 Papua New Guinea occupies Arawa. Governments and Local-level Governments [Amendment No. 1] Law). 11 Dec 1997 Unarmed "Neutral Truce Monitoring Group for Bougainville"
No. 35263 of 5 Dec 1997). Army) Lincoln Agreement, effective 30 Apr 1998. Reconciliation Government Charter), but is not implemented. 30 Dec 1998 Request for UN peacekeeping force renewed by Papua New Guinea. 1 Jan 1999 Bougainville government suspended by Papua New Guinea. 13 Dec 1999 Bougainville Interim Provincial Government inaugurated. 17 May 2004 Kingdom of Me´ekamui established with Francis Ona (b. 1953? - d.
2005) as king declared by proclamation (not recognized). Peace Agreement (date originally scheduled 15 Jun 2019).